Global Women | Opinion: Why do we still not recognise dads as equal parents? Home > Discover > Whānau and Work > Opinion: Why do we still not recognise dads as equal parents? Opinion: Why do we still not recognise dads as equal parents? Only when mums and dads are considered equal in parenting will we be able to achieve gender equality in the workplace. While women’s place in society remains fixed as the ‘primary caregiver’, it will be mainly women, and not men, who take time away from work to raise their children or downshift into a part-time or lower-paying role to be more available to their family. And let’s be honest here, as long as this is the case, for employers there will always be disadvantages to hiring a woman over a man, there will always be less of an incentive to invest in and promote female employees. As a leader, if you know it will always be the woman rushing off to pick up sick children rather than the man, it’s not unreasonable to be concerned about women’s ability to meet the demands of their professional role. This is one of the reasons why it is essential that – in addition to women leaning in – men step up. It’s why it’s essential we update our attitudes towards men’s and women’s roles in parenting. And it’s why we need to extend more family-friendly laws, policies (and attitudes) to male employees. The ‘primary’ and ‘secondary’ carer approach to new parents’ leave simply isn’t working, reflected by the fact that the number of men taking it has hardly changed in a decade, from 220 in 2008 to 324 in 2017 (compared to 30,000 women). Typically dads only have access to two weeks’ unpaid leave in New Zealand. The government must update its antiquated parental leave policy. This lack of time off impacts a man’s ability to raise his family, and a woman’s ability to return to work and progress her career. In New Zealand, Vodafone voluntarily tops up the government’s paid parental leave payment (currently $538.55 before tax) to 100% of an employee’s salary. But again, this is only available to the ‘primary’ carer. 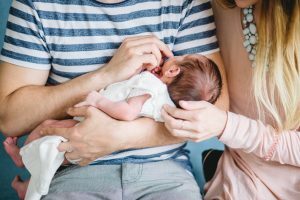 ANZ, thought to be the most generous of New Zealand’s large employers when it comes to paid parental leave, provides workers with two weeks of paid family leave. We need the government and employers to make some important changes if we are to achieve true gender equality in New Zealand. If your company’s policy supports both parents to take time off to raise the family, we would love to hear from you. Email annabel.coxon@globalwomen.org.nz with your experience.